The Mystery Feast isn’t a book I went looking for. I suspect it found me. I was aware of Nigerian author Ben Okri as any Booker Prize follower must be aware of him. His novel The Famished Road won the Booker Prize in 1991. One evening, I was looking for something else on Amazon and came across The Mystery Feast. It was described as Okri’s thoughts on storytelling. It was also less than 5 euro, so I ordered it. When it arrived, it was a puny book, about the size of a CD cover and a bit thinner. The paper was thick, and the font was large. I wondered just how much wisdom could be packed into 38 mini-pages. Once I started reading, I found myself underlining passages on nearly every page. The bulk of the book is an address given at the International School of Storytelling at Emerson College in 2013. In it, Okri talks about the role of storytelling in contemporary society, he philosophizes on the origin of stories, and warns of the power of storytelling. 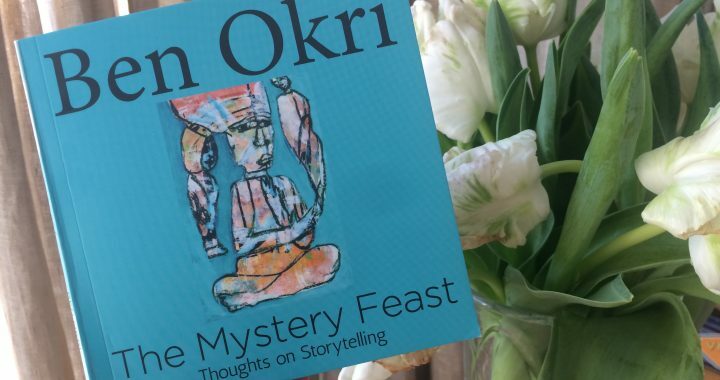 Of all the things humans have put on earth, Okri claims that “Stories are the highest technology of being.” They are important because they hold great meaning and give humans a way to address the greatest mysteries of life. The story is never really just about seven dwarves, or it would not linger in the imagination. The story is always about more than the story. The story lives in a context, in a web of references that the audience is either aware of or not. Each listener or reader has a different experience with the story, based on their context. Great stories have this effect. Think about animated movies like Shrek, which are enjoyable stories in their own right, but have layers of meaning that only those who can place the film in a larger (usually adult) context can appreciate. Space Balls is another example (and here’s one of my favorite moments). The film is senseless to anyone unfamiliar with Star Wars but potentially riotous fun for anyone who is familiar with George Lucas’s franchise. Story is the way we talk about things we don’t know how to talk about. This starts in childhood when we tell children fairy tales and fables to teach them lessons about life. Children understand these stories better than abstract lessons. Australian storyteller Susan Perrow has written extensively about the therapeutic power of story for children and the places adults must go to meet them. In her book Healing Stories for Challenging Behavior, she writes about how to use stories for children. But she starts with adults. Nourishing the imagination, stories can help us as adults to shed our caterpillar skins, metamorphose into butterflies and explore the gardens of ‘hidden’ reality. When my children were younger, there was a period when they would pretend at being hurt to check my reaction. Talking to them about the way their games might mean I didn’t see when they were really hurt made little difference. The story of The Boy Who Cried Wolf, however, made sense. I told the story every morning as we biked to school for a while. First because I wanted them to hear it and then because they wanted to hear it again and again and again. Stories are more than the story. But where do these stories come from? Okri’s answer gives credit not to the author but to a shared human history. He writes that “to read a true story, or to listen to one, is not to experience the story of the person who wrote it, or the person who tells it. It is to read or listen to the genius of the tribe and the race. It is to listen to the genius of humanity.” Stories draw on more than the experience of one human being. He implies here that there is a difference between a true story and a story that is not true. True can be understood as well-tuned, precise, accurate. It has nothing to do with fact or fiction. True stories are stories that resonate with their audience and have integrity. I refer to these as heart stories, the stories that come from a personal core or the core of humanity, to follow Okri. They are not stories that entertain for a moment or fill a space, but stories that represent a greater truth, perhaps greater than any one individual can comprehend. But what do stories do? One must only glance briefly at the headlines today to see that a compelling narrative can throw even the idea of truth into question. Fake News can become something we talk about outside of classroom discussions of Orwell’s 1984. The power to control the story is the power to control the masses. Our history tells us this is true, whether it’s Little Red Book, Nazi propaganda, or Make America Great Again, compelling stories can distort reality and change the course of history. But it’s not hopeless. Where there can be bad, there is also space for good. Okri writes hopefully, beautifully about the possibilities of good stories. They “point the way upwards. This is their enigma. It is not enough to read or listen to them. We must continually meditate on them to extract their timeless wisdom.” These are the stories we have to repeat, whether in the tales we tell our children and each other or in our media; in books and movies and series. We must tell stories that compel and provoke our audiences. We must tell stories that inspire them to be better in the world. So, this is Okri’s message, that stories are more than a plot and greater than the individual, that they are powerful mediums to be used with and care. What does this mean for the contemporary storyteller? What does it mean for the individual who wants to tell a story about their professional accomplishments or their personal life? On the one hand, it’s all a bit mystical and that can be off-putting for some. If you wanted to give a TED Talk style presentation and found yourself reading this for guidance, you might feel lost. And yet, Okri is exposing here the very mechanisms that make TED Talks and other modes of storytelling compelling. It’s the link between your story and a broader shared truth that makes it compelling. My story about falling into a depression when I first moved to the Netherlands about neither depression nor the Netherlands. It’s about loneliness and self-doubt. It’s about the intense need for human interaction that we all have, regardless of our age, situation, or location. Our greatest stories will be those we tell with our audience in mind as more than a demographic. Our greatest stories will be those we tell in which we embrace our audience as fellow members of humanity. Our greatest stories will tap into shared emotions. In that vulnerable space, we can embark on the journey of your story together. Edited 7 February 2018: I originally wrote that Star Wars was Spielberg’s project. This is, obviously, totally and completely wrong. My apologies. It has been corrected to George Lucas’s project. Posted in Storytelling and tagged Book review, universal theme, writing.